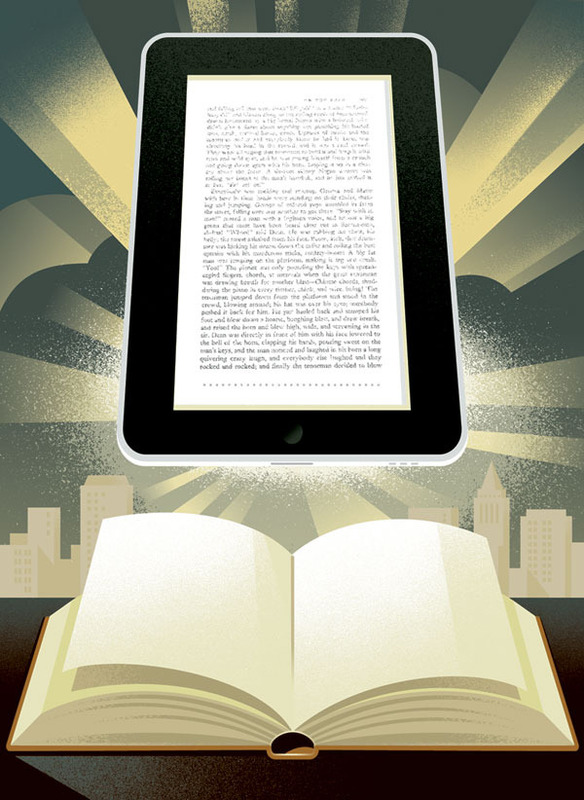 Chris Curry at The New Yorker called last week for an illustration to accompany a piece by Ken Auletta about the iPad and its effect on the book business, digital publishing and e-books. This is my first assignment from The New Yorker, and I had a little thrill seeing it in the magazine yesterday. I went down to Barnes & Noble to get a copy before mine arrived in the mail, and there was a video hyping the Nook playing in the quiet store. Love that technique of yours, color, everything. I particularly like how you have text on the pad but it's obscured just enough to be unreadable.. I always have trouble when doing a book or phone. What to put on the screen? You figured it out. I agree, poster-like. My take on the image though is that the iPad stole the type off of the book and thereby killed the book. Stellar piece Paul. Kinda feels like the Ten Commandments, Tah Dah! Done to your usual high standard. Actually starts to make me want one. Just bought this today to read this article. Awesome illustration. Funny, too.